Most officers spend time attached to a Police Tactical Unit company during their career, so physical and mental fitness is essential. PTU Headquarters Chief Inspector (Support) Lai Chi-man said: "Officers undergo intensive training in different areas of demanding police duties including internal security, crowd control, apprehension of armed criminals and high-rise sweeping. To effectively perform these, they have to carry up to 18 kilograms of equipment and frequently work long hours in hot and humid weather. Physical fitness is a must and takes up about 17 per cent of training time." "We would therefore like to urge officers to start exercising about three months before joining PTU by working out three to four times a week for 45 minutes, so they can meet training needs, make the most out of their attachment and minimise the chances of injury." CIP Lai said although officers undergo a thorough medical examination, they should inform doctors of their family medical history. Information booklets on training are distributed to Regions up to three months prior to PTU company formation, giving officers a better idea of its training programme, and spelling out fitness requirements. It also gives advice on nutrition, weight control and healthy lifestyles. 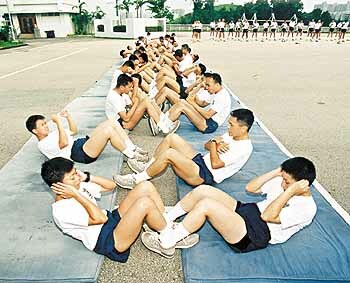 PTU Physical Training Instructor Kwok Ping-tong said: "We also strongly advise officers prevent injury by having a thorough understanding of their physical condition, enough rest, by not exercising during illness or on medication, by warming up and down and not pushing too hard, drinking plenty of water, by not eating two hours before exercising and by avoiding heat stroke during hot and humid weather." Inspector Kwok said regular exercise also helped alleviate stress and was essential for a healthy life. "Officers should exercise more, whether or not they are going to PTU, so that they can stay physically and mentally fit." Zulu Company officers training at PTU HQ on September 4 said PTU training was also fun, adding instructors were understanding and ready to help. They said officers who were physically and mentally prepared and living a healthy lifestyle, need not worry at all about PTU training. For enquiries contact CIP Lai or IP Kwok on 2669-6213 or 2669-6344.